These Jimmy Dean Simple Scramblers are found in the refrigerated section of your grocer. I like that they aren’t frozen and they don’t have potatoes in them. Just eggs, cheese, and some meat. this was a good match for the Keto diet I tried out. Preparation is super easy and quick. You open the sealed package and remote a small sealed cup that contains liquid eggs, and also a package that contains the cheese and meat. Empty the liquid eggs into the cup and place in the microwave for a short time. In mine that’s 60 seconds. After a minute you take out the now hot cup of liquid eggs, and open the package of cheese and meat and stir it into the cup. Place the cup back into the microwave and cook it a second time. In my oven 50 seconds is what I use to finish cooking the mixture and have it solidify like scrambled eggs do when cooked. I remove from the microwave and add pepper or some hot sauce and then it’s ready to consume straight from the container. I like that it yields pretty tasty results with a minimum of preparation effort or things to clean up. Jimmy Dean Simple Scrambles Meat Lovers with Sausage Cheddar Cheese and Bacon, 5.349 Ounce — 6 per case. Jimmy Dean Simple Scrambles Bacon, 5.35 Ounce — 6 per case. Jimmy Dean Simple Scrambles Sausage, 5.35 Ounce — 6 per case. I like all of them and usually pickup at least one of each of the three varieties. The pricing in the grocery store is much less than what I saw when adding the Amazon shopping info to this post. Here are some of the frozen lasagnas that I have tried and my thoughts. If you know someone who insists upon always making their lasagna from scratch, hug them after reading this blog post. I don’t have time for that and like many folks buy frozen food instead. Here are some of the frozen lasagnas that I have tried and my thoughts. Publix Lasagna with meat sauce was good and probably the lowest cost per serving of the ones reviewed here. I don’t remember how much I paid for it but I know I bought it because it was on sale. I’d buy it again on sale. Devour’s Lasagna Alfredo with Bacon and Sausage tasted pretty good. I’m accustomed to lasagna with red meat sauce so this was a departure from my usual choice. I’m pretty sure I also bought this when there was a sale and mentally placed it on my buy again list after eating it. I’m certain that I’ve had a couple more varieties of frozen lasagna that aren’t listed here, simply because I forgot to take some pictures of the boxes. My favorite brand of frozen lasagna is Stouffer’s. 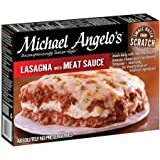 This Stouffer’s Lasagna bake with meat sauce is pretty good and similar in taste to their regular meat lasagna in a square container with cheese on top. I would say it’s my standard “frozen lasagna go to” when I’m shopping the frozen food aisle at the grocery store. 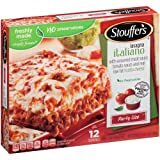 The top pick on my list of frozen lasagnas is also from Stouffer’s and it’s their Meat Lovers variety. Delicious! The family size meals are enough food that I usually eat half and then later reheat the remaining portion for a second meal. This selection has plenty of chicken pieces and I like it. This is similar to the one above but it’s a single serving size and has some additional vegetables. It’s a good Alfredo dish but I’d rather have the Chicken AND Shrimp dish that’s farther down on this list. This is another larger serving size that I use for two meals. It’s cheesy and meaty so I really like it. I find it to be rather filling. This is very similar to the one above but it’s in a single serving size and not as cheesy. I add some Parmesan cheese of my own when I prepare it. This is my second most favorite white sauce entree from Marie Callender’s. Creamy and a tasty portion of two proteins. This is my favorite white sauce entree from Marie Callender’s. I use a good amount of coarse ground black pepper on mine and I find it to be nice and creamy and satisfying. I really like this entree and I always prepare mine with the addition of some coarse ground black pepper . I stir it up well to get the sauce all over the rice. I add some soy and teriyaki sauce of my own just before serving. Stir the contents so that the sauce is mixed well and coats the rice and other items well. There’s a sort of sweet taste to the sauce that’s nice and I’m pretty sure there are some crunchy water chestnut slices in it as well. This one’s in my top 5. This is one of my favorites. A key to making it even better is to stir the contents around so that the cheese sauce is distributed over all of the rice and broccoli. This is one of my least favorite selections among those in this post. It’s not bad but if I’m going to eat Salisbury Steak, I prefer Stouffer’s. 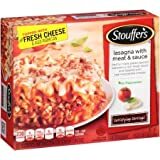 Speaking of Stouffer’s, I’ll have a post similar to this one listing entrees from them and my thoughts at some point in the future on this blog.